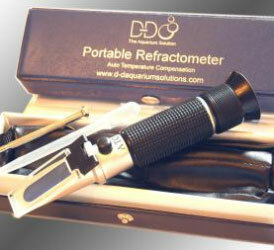 Salinity Refractometer by D-D The Aquarium Solution. The refractometer works on the principle of refraction of light to determine the salinity and is very accurate but also very simple and robust, unlike good quality glass hydrometers which are easily broken. Light enters the instrument at one end and passes through a sample of the aquarium water which causes it to be refracted, (bends the light), depending on the salinity of the water. The refracted light is reflected off a scale inside and can be viewed through an eyepiece on the opposite end of the instrument.